This is the monthly update of the state of Indian stock markets. 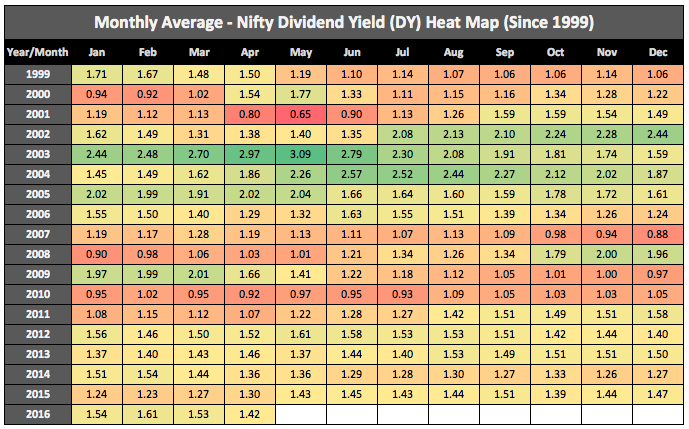 As of now, it comprises only of an analysis of Nifty50‘s ratios, namely P/E, P/BV ratios and Dividend Yield. But before that, lets see what happened in June 2016, which was a month of exits. RBI Governor Raghuram Rajan said No to a second term and instead, has decided to return to academia (lucky him!) after his term ends in September. Read his address to RBI staff here. People termed it as Rexit (= Rajan + Exit). I am a fan of Mr. Rajan for his sensible views and how he took a tough approach towards cleanup of PSU banks. Personally I think that having him around with the current PM in driver’s seat, would have been great for the economy. But life moves on and so will the Indian economy. Then people of Britain decided to do a Brexit (= Britain + Exit) from the European Union (EU). In short term, Indian markets were expected to react negatively to the news of Rexit. But that did not happen. Tells how brutal the markets can be towards people’s expectations. 🙂 As for the Brexit, there was a knee-jerk reaction when indices fell more than 2% in a day (might look like a big drop in short term but is nothing when long-term is considered). Some stocks whose business is dependent on British and European economy, witnessed far deeper one-day cuts. But markets seem to have recovered since then. Experts are still trying to predict the consequences of Brexit. But no on seems to be sure about the actual impact. Whether it will result in a mild recession in UK or whether government will eventually disregard people’s verdict in referendum and stay back in EU – no one knows anything. The numbers are averages of P/E, P/BV and Dividend Yield in each month. The heat maps don’t show the maximum and minimum values of each month. Don’t make any investment decisions based solely on just one or two ‘average’ indicators. At most, treat these heat maps as broad indicators of market sentiments. You can read about last month’s update here. The State of Markets section has also been updated (link). This is the monthly update of the state of Indian stock markets. As of now, it comprises only of Nifty50’s P/E, P/BV ratios and Dividend Yield. The numbers are averages of P/E, P/BV and Dividend Yield in each month. The maps don’t show the maximum and minimum values of each month. So do not make any investment decision based solely on just one or two ‘average’ indicators. 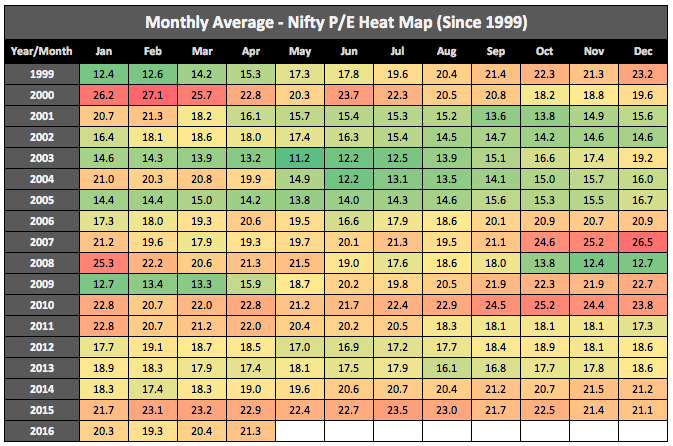 At most, treat these heat maps as broad indicators of market sentiments. I regularly update the State of Markets section (link) on Stable Investor. 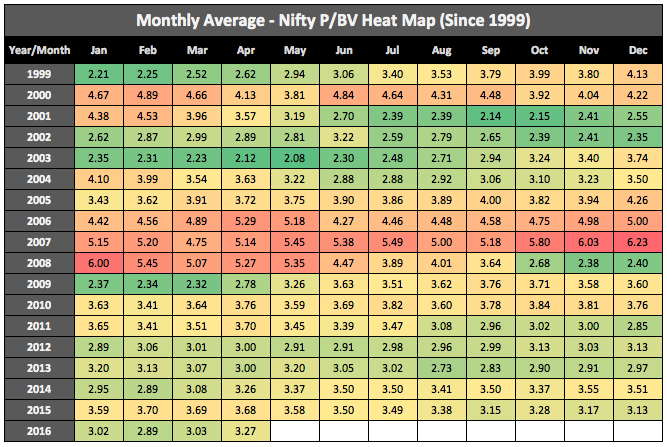 This time when I updated it, I took a step further and decided to try and publish heat maps for 3 popular ratios (P/E, P/BV, Dividend Yield) of Nifty 50, on monthly basis. The numbers are averages of P/E, P/BV and Dividend Yield in each month. The maps don’t show the maximum and minimum ratios of each month. As with any such ‘average’ indicators, its worth saying that you should not make any investment decision, based solely on just one or two indicators. At most, these heat maps should be treated as broad indicators of market sentiments. I am planning to see whether I can also bring in data for some other mid-cap / small-cap indices from next month. Do share your feedback and help me improve these monthly State of Indian Stock Market posts. IOCL’s Disinvestment & How You Can Benefit From It? Almost a year back, I had done a case study on Indian Oil Corporation Ltd. The study was an exercise to find a correlation (if any) between company’s share price and its book value per share. And surprisingly, this graph showed something interesting. To cut the long story short, it clearly showed that share prices of IOCL (almost) never stayed below its book value for too long. So with prices hovering near 200 and adjusted book value of 250+, it seems that it might be a good time to look at this stock again. During the last 15 years, share prices of IOCL have dropped below its book value only thrice. Once during the dot com bust of 2000-01, in crash of 2008-09, and now. And presently the Price/Book Value stands at a pathetic 0.75. But this does not mean that prices cannot fall any lower. They can go down further. But also, the chances of Book Value going down are very remote. Even if we assume a nominal 5-8% annual increase in book value, the price at which shares are available seems to be quite cheap. But you cannot deny the presence of massive refineries and oil pipelines. And just to give you all an idea of cost of building refineries, just head to this link to see costs of various projects being taken up by these Oil Marketing Companies. Just the cost of putting up a new refinery is in excess of Rs 30,000 crores!! But on stock exchanges, the entire company which owns 10 such refineries is available for just Rs 50,000 crores. And I haven’t even taken the cost of laying more than 11,000 kms of oil pipelines. Nor have I taken into account the country wide network of retail outlets and a decent overseas presence in Mauritius and Sri Lanka! And if one closely monitors the energy space, one would understand that it is now almost inevitable that subsidization of fuel would be handled more prudently by the government in years to come. And going forward, with reduction in subsidies by government & various caps on LPG cylinder’s domestic consumption, there is a decent possibility that OMCs like IOCL would benefit in the long run. But this would not happen overnight. And patiencewould be a key here. Agreed that with elections around, there might be temporary vote seeking measures like increasing the no. of subsidized cylinders, etc by the ruling parties. But things are changing on the energy administration space. And in due course of time, these subsidies would play much smaller role when people evaluate the oil companies. (Caution: The paragraph which you just read is full of speculation). Another indicator of stock’s undervaluation is the ongoing discussion on disinvestment. The Petroleum Ministry has summarily rejected Department of Disinvestment’s idea of a stake sale. The reason being quoted is huge undervaluation of shares. But govt seems to have decided for stake sale and may eventually go ahead with sale of its stake to other energy companies like ONGC, OIL, etc. In past too, government has resorted to the so-called cross-holding route to shore up its revenues.Or the government might try the ETF basket route (source). But all-in-all, this indicates that prices are quite low, and even if they were to go down a little further, which is of course possible considering the overhang due to disinvestment and other election-related-factors, it might be a good idea to accumulate this stock for long term. If not for appreciation, then for a decent dividend yield going forward. Note – This post should not be considered as an advice to buy shares of company discussed above. Disclaimer – Long term positions in IOCL. From a high of 185 in January 2013, IDFC has grinded down to 128. That’s a fall of close to 30% for a large cap financial institution. So, for the time being, we keep aside IDFC’s banking foray and look at its existing businesses and valuations compared to historical averages. IDFC is an infrastructure finance institution providing end to end financing and project implementation services. The company also provides advisory, PE and AMC services to name a few. Company grew at a fast pace during the last decade. Its sales have increased from 424 crores in 2003 to around 6100 crores in 2012. That’s a CAGR of around 34%. Company came out with its IPO in 2005 at Rs 34 per share. Since then, sales have increased at a similar rate of 35% per annum. During the same period, profits have grown from 180 crores to 1600 crores at rate of 27% plus. Earnings (per share) have moved up from 1.8 to 10.3 in 2012. In line with EPS, dividends have started increasing in recent past and now (in 2013) stand at Rs 2.6 per share. In last 5 years (barring 2009), company has continuously increased its dividend per share (1.2, 1.2, 1.5, 2.0, 2.3, 2.6). IDFC is a financial institution and hence it makes more sense to analyze company’s Price to Book Value to gauge how over- or undervalued the company is. Company has grown its book value from 16 to 81 in last ten years. That’s a CAGR of more than 20%. We analyzed historical data to check the P/BV multiples at which IDFC has traded. Average P/BV after listing (in 2005) for IDFC stands at close to 2.3. Also it has oscillated in a P/BV range of 1.0 to 5.0. At present, the stock is available at a P/BV of 1.6. That itself points to a 30% undervaluation from historical averages perspective. Below graphs show how IDFC is currently positioned on parameters like P/E & P/BV when compared to its historical averages and FY 14 & 15 estimated figures. The company, though well managed and growing at a decently fast pace, seems to be undervalued. We have not analyzed management, business, etc as this post was more to do with valuations based on simple historical parameters. But being headed by Deepak Parekh and his team, it is assumed that management would be doing a decent job. In case you are interested in understanding more about the business, management and other factors, we suggest a simple Google search. It will throw a plethora of brokerage reports analyzing the same. You can also access company’s latest Annual Report here. Now with a sustained ROE of close to 15%, a business like IDFC’s should command a multiple higher than what it currently trades at. And though we love dividends, we don’t expect IDFC to dole out generous dividends to its investors due to its fast growth. Even then the stock is currently available at a decent yield of 1.8%. And with dividend growing year on year, this Yield-On-Cost is bound to increase in future. But remember one thing, IDFC is interested in getting a banking license. And there are high chances that it might get it. But we cannot be sure of this unless we are in RBI’s decision making committee. 😉 So if you do invest in the company, be ready to accept volatility in its share prices due to negative or positive news flow. Disclosure – No positions in IDFC. A Case Study on Balmer Lawrie & Co., its Book Value, Dividends & how to decide when to buy this stock? After doing case studies on ONGC and IOC, we chose another company from our Dead Monk’s Portfolio for case-based analysis. But before we get down to details, just have a look at the 2 graphs given below. One shows increase in book value per share during the last 10 years. The second shows increase in dividend per share during the last 10 years. It has also increased its dividend per share from Rs 1.80 (2002) to Rs 28 (2012) at a compound annual growth rate of an astonishing 32%. Even if you consider the last 5 years, growth rate has been a market beating 16%. In India, dividend stocks do not get the respect they deserve. A similar stock in US markets would have definitely found a place in USA’s coveted list of great dividend stocks: S&P Dividend Aristocrats. Almost 8 out of 10 people involved in stock markets have not heard of this name. People don’t even know about the existence of this company. And even if they do, they don’t understand the rationale behind the name, let alone the heterogeneity among its business verticals. So let us first introduce the company to you. The company operates its businesses under 5 heads – Tours &Travels, Industrial packaging, Logistics, Lubricants & Others (engineering products, tea packaging, leather chemicals, etc). You can read more about the company here. How has Balmer Lawrie increased its book value and how this data can be used to enter this stock? The red blocks in above graph are book value per share over the last 10 years. As already discussed in earlier graphs too, it has been on a constant uptrend since last 10 years. On the same axis, we plotted the share prices. And it is not very difficult to see that book value has acted as a strong support for the stock price (a similar pattern was found in our analysis for Indian Oil). The stock price has rarely fallen below its book value. And when it has, it has almost always moved up into higher zones. Can we use Price/Book Value as a parameter to check stock valuations and as a criteria to enter this stock? Assuming Balmer Lawrie maintains its generous dividend payout policy, how can we use Dividend Yield as criteria to enter this stock? …that above approach uses just 2 parameters, P/BV & Dividend Yield to decide about when to buy the stock. You as a reader should remember that there is a considerable difference between real life and case study. One should never invest based on just one or two parameters. This case should not be taken as an investment recommendation. Do your own research before investing your hard-earned money.